When the Internet noticed the policy change it did not go over well. Many accused Spotify of overreaching and asking for too much personal information. Officially, Spotify hasn’t said why it wants all this information. On Thursday, we speculated that the new sensor data might have something to do with Spotify’s new running feature. As for the rest, we weren’t sure. 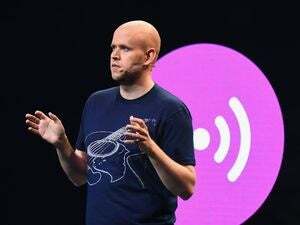 Since our first report, Spotify CEO Daniel Ek took to Twitter and hinted at what we might expect to see from the music streaming service in the future. @rmilneNordic @notch we don’t. But there’s a feature called find friends like in many other apps. And in that we may ask for it. Currently, Spotify is all about helping your find friends through Facebook. Anything that helps Spotify move beyond that would be a great addition. The question is how will Spotify handle your address book? Will it want to keep a stored record of your contacts to notify when people you know join Spotify, as some apps do? Or will this be a one-time matching service that only happens when a user initiates it. How your data is handled would be the bigger privacy issue, considering most of us already store contact data with Facebook, Google, LinkedIn, and Microsoft. The second hint Ek laid down in his Twitter chat with Persson was over accessing your photos. Spotify may be planning to let you add a custom image to your playlists or change your profile pic with your device camera. “Twitter doesn’t need your photos. But it’s nice that I can post a photo,” Ek said. Persson responded by arguing that music apps don’t need a feature like that. “If you want to personalize a playlist by having a custom image or a new profile pic I’d say yes,” Ek said in reply. It’s not clear if Ek was hinting at future features for Spotify or just general examples. However, considering all of those features are currently missing from Spotify and would help improve the app it’s a good bet we’ll see something like them in the near future.